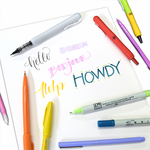 Zig Clean Color Markers are perfect for quick illustrating, sketching, designing and cartooning. These markers contain high quality, water-based dye ink. They are odorless and Xylene-free. Use a little water to easily move your marks and create watercolor effects! Try the Zig BrusH20 water pens! Purchase of a Clean Color Real Brush set of 48 includes a BrusH2O water pen! Empty cases are available HERE to help you easily store all of the Clean Color markers you already have!